My laundry room is really a hall that leads from the garage to the house, plus it has to pull double duty as a place for my craft things, the second refrigerator, and currently unused decor storage. Wow, that's a big order for such a small space. 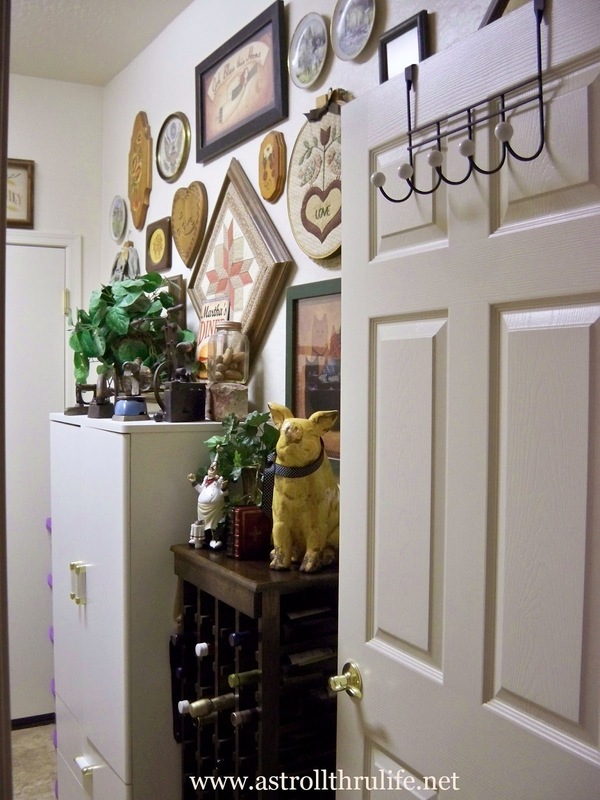 Standing in the hall, (it's hard to get a picture), you can see the fridge, and washer/dryer on the left with a wine cabinet and white craft cabinet on the right. Definitely not room for anyting else. This is a really old fridge and my washer/dryer are old too, but they all funcion beautifully, so I am not getting rid of them yet. The fridge has a collage of pictures of my grands that always gives me a smile when I see them. I need storage, so above the fridge is a great place for my little wooden childs wagon. 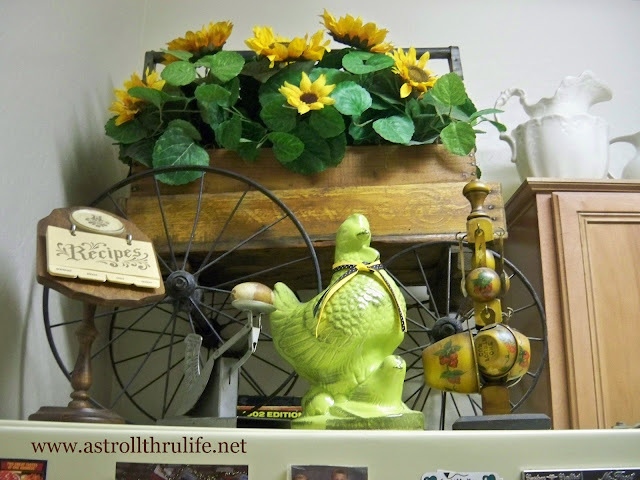 It holds my dad's old toolbox full of sunflowers. There's also a few other accessories not currently in use. The cabinets above the washer/dryer store some of my pitchers and roosters not in use. I love my W A S H knobs on the doors. So fun. On the right side as you enter, you see a small wine cabinet, it holds a few bottles we have for company dinners and even more accessories that I need to store when not in use in the rest of the house. Next to that is a cabinet that holds my sewing machine and craft supples. I have a ton of things on the walls that mean something to me, just no where else to hang them. These are all things that I have fond memories of finding with a dear friend or things my mom and I made, such as the quilt blocks. My collection of old irons is on the craft cabinet. More memories on the wall. I think I just about covered every square inch. 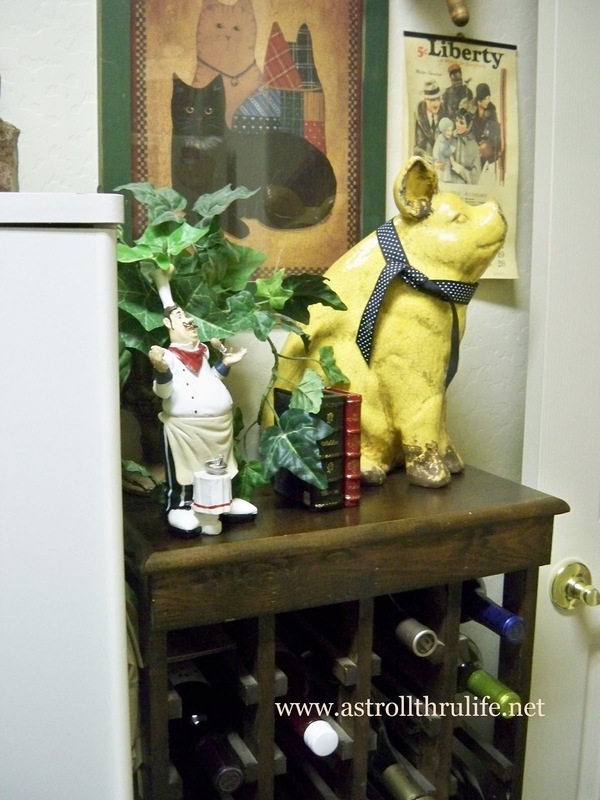 The wine cabinet not only holds wine, but it's a great place to roll up placemats that you aren't using and slide them into the wine slots. That's a lot for one small space to carry off, but it works beautifully. I like being in this little room, it is fun to see memories all around me. So, does your laundry do double duty too? Question, does anyone know what happened to Liz at Savvy Seasons by Liz? Her blog is gone and I don't have an email or anything. Can anyone help me find her? Thanks. I just got an email from another blogger that says she stopped blogging but is well. Just time to take a break. Hopefully she will check back in soon. An area that is usually ignored as a pass through hallway you have made into a gem. It is warm and inviting, what a lovely place to do laundry. Gorgous quilt blocks. Marty, what a great way to use your space! I love all your memories on the wall! Mine at the city house is a walk thru but way smaller. I am excited that the farm one is large, off the kitchen and a pantry to boot. I foresee lots of storage happening there! Wow! Looks great. You used every inch of space to make you happy. Looks great! Your laundry room is definitely multi tasking:) I love it. Keep things real...another thing I love about your blog! 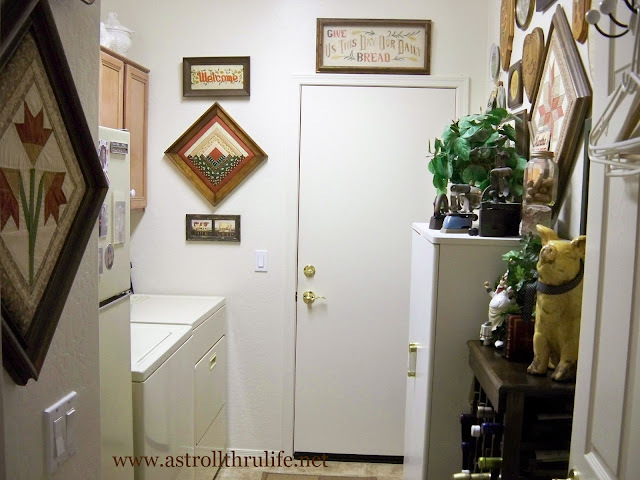 I posted my laundry room remodel and yes its multi tasking as well! You packed a lot into one room, but it is functional! One might try pinterest under the blog name. I'm not sure one can contact someone there directly, unless the account was set up that way, but for example, I receive weekly updates with comments people made on my board and repins. Our laundry room is on the sleeping porch and it is in a state of disarray. You sure did!! It's nice to have all those sweet mementos around while you're doing laundry. My laundry is the same way (hall from garage to house) but smaller! teeny tiny! I love your WASH knobs...I might have to steal that idea. :) Have a great weekend Marty! I want that green chicken! indeed, great use of space. What a fun laundry room. Hmmmm...I think I need to make my laundry room less generic. Since I'm the one who usually sees it, I should make it more "me." I do have pictures of my grands in it, but that's pretty much the only thing homey about it. Love some of your accessories...I have an iron similar to the one in the middle. You are lucky that your "laundry" space is so spacious! What a bonus to be able to fit all those other things as well!! You have made it look very coordinated! Sometimes that much decor can look overwhelming. You have pulled it off well! :) LOVE the WASH knobs!! Decorating such a small space with so many purpose is quite a task. It can look overly-cluttered to just plain messy. But I must say Marty, as expected, your space is the perfect example of how to properly and beautifully do it!!!! Love it dear! I love your washroom! I love that you have packed it full of things you love. What a great idea for a room whose usual purpose is mundane! I was especially interested in your quilt blocks. I love them framed. My laundry room is a similar set-up, Marty. Not really a room but more of a hallway that includes the garage door, and further along it is what was a storage room, but what is now my craft/sewing room. It doesn't allow for a lot of "things" so its size keeps me from making it cluttered. The only time I have an issue is when I have a piece of furniture I'm working on and it sits in this area until it's done and ready to move out! I have no idea about Liz. I do remember her saying she'd be around a bit less because her girls were out of school now, but I didn't know her blog was missing. Hopefully, she will check in and see your post. Great little room. I just have the basement at my house for the w/d. Growing up we had a great laundry room big enough for a freezer and cabinets etc. At 1515 I am lucky to have a big utility room with a large counter, great for buffet family dinners. 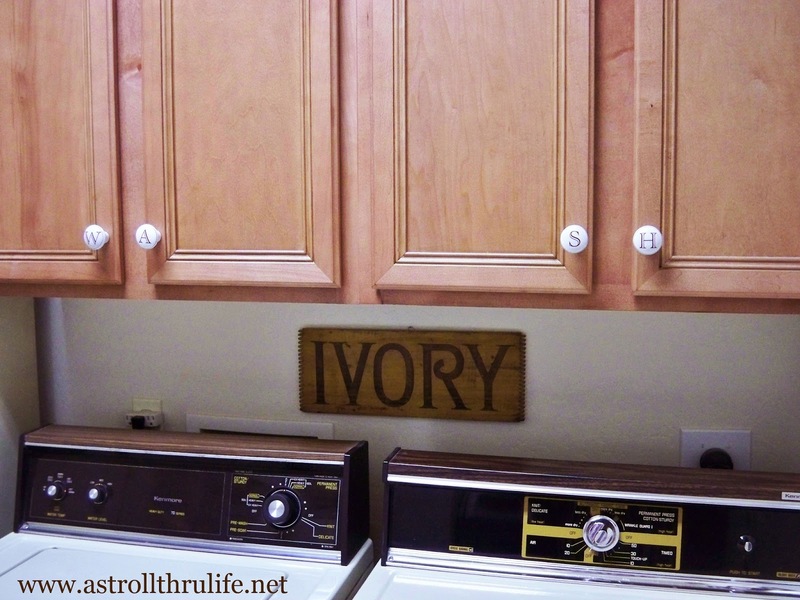 I love those WASH knobs - how adorable!!!!!! You utilized and decorated the whole space so well! I tried going through her Pinterest, but the connection to her blog doesn't work there either. Would you look at all those blog parties!! Of all of them I have only visited Between Naps on the Porch. So many of the blogs have sort of become advertising space..it's interesting. I was hoping we would get to see the inside of your sewing machine cabinet. I've trying to find one..
Marty...why are so many blogs advertising on their sidebars etc?? I don't understand. WEll, darn!! I forgot to tell you how cute your laundry room is. I've never had one. My washer and dryer are always in the garage! :( I always wished I had one with room for my ironing board to always be up and a sewing area. One of those ironing boards that are in the wall would be wonderful. I still could get one of those one day. 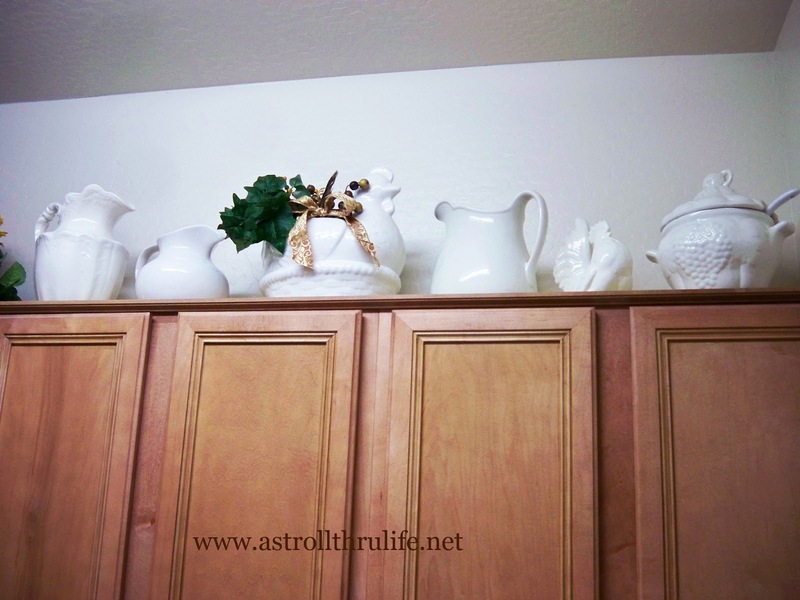 :) Are there shelves in your craft cabinet?? 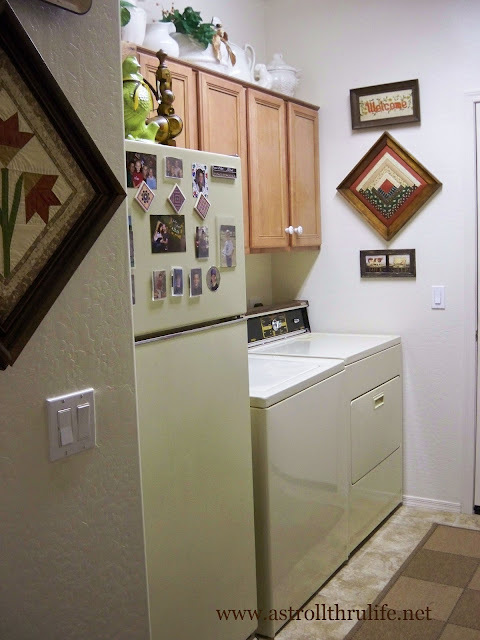 I would love to have a laundry room like yours for double duty, mine is barely big enough for the washer and dryer. Love your old irons! Yes it does. My laundry is also the pass through between the garage and the house ( funny, I have never thought of it as such) Sadly the most unorganized space in my home. NO pictures :-) Not a one!!! It is on the list to e redone however, but it's the getting to it that is the problem. You have made yours such a cute spot. So pretty. I also have a collection of old irons from my grandparents & a wood ironing board. Hugs! What a useful laundry room Marty! I love the decorations in there, especially the special momentos from your family and friends. Marty, You have done a great job on using this room for several purposes. I would love to have a larger laundry room. If like me, I am always in search of how to create extra storage. In my laundry room, smaller than yours, My husband found a white shelf from our Lowes Home Improv, store and brackets,(which cant be really seen either) and added the shelf over top of our washer and dryer units. It hid the wall hookups(but not the outlet), and gave me extra space to add pretties and things that are necessities, which I placed in pretty baskets. I am always admiring your décor and always in search of more space! :))) Looking forward to your next post! I think you've done a terrific job on taking your small space and making it so warm and inviting. 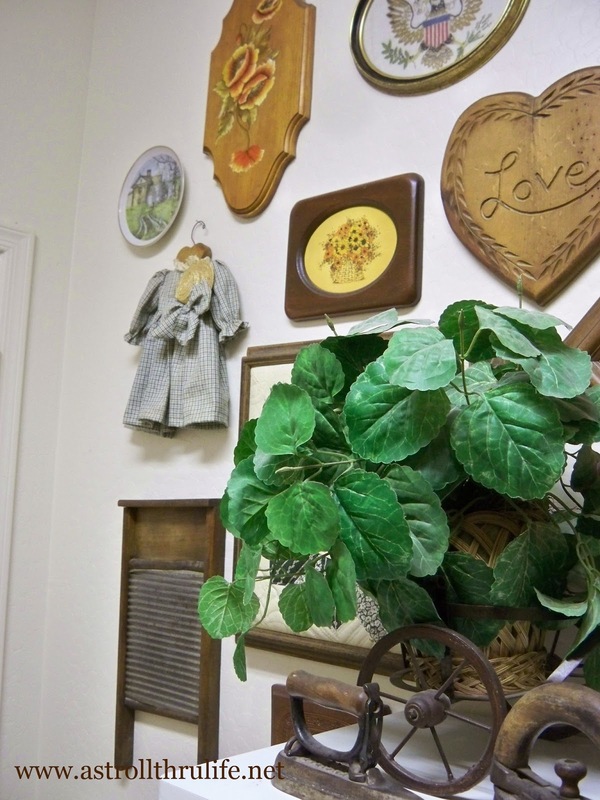 I love how everything in your room is special to you, including your "old" washer, dryer and refrigerator! Thank you for the inspiration! What a lovely room redo! I adore your gallery wall! So many pretty and fun things in this area...kind of like a ship you have used your space in there so well. I am lovin' your washer and dryer. Seriously! Those are made to last. Hubby and I had to buy a new set after our last ones went on the fritz. They were only three years old. Why can't things last longer now a days? Boo! Love the white ironstone pitchers! 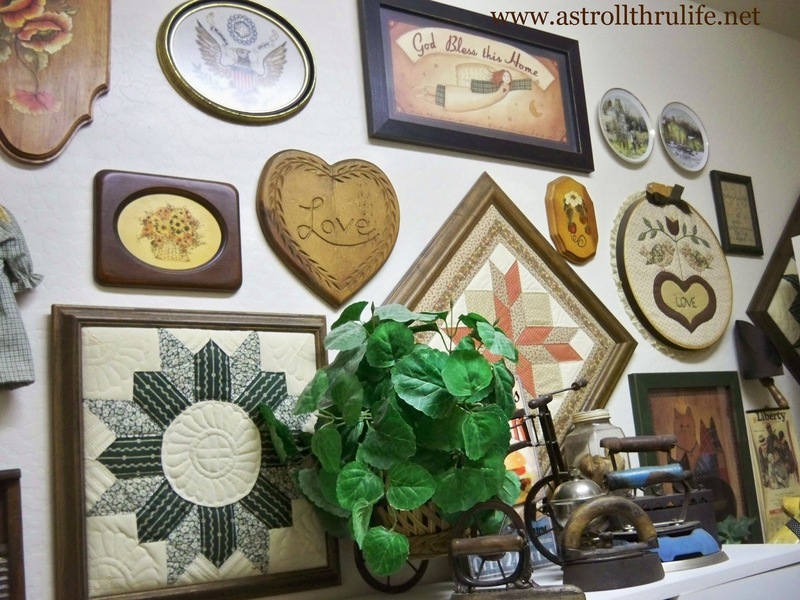 What a nice way to enter the house, seeing such nice mementos - the quilt blocks are so pretty. Your laundry room looks really great Marty! Love the old irons and the white pitchers. My laundry is in my garage so I don't have separate room. 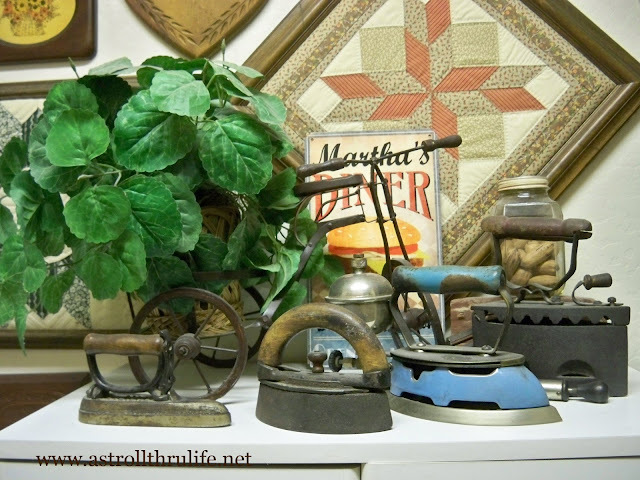 So many treasures Marty...LOVE your laundry room! WASH knobs are too cute...clever!!! Thanks so very much for sharing at AMAZE ME MONDAY!! !